I thought this feeling won't be visiting me again. Why do I feel so lonely? I guess this is normal to those single people who are miles away from their family and love ones. In my case, I have felt the same thing before, it was about few months when I started working in Singapore and now, after just few months of working here in Dubai its like "history repeats itself". But I am proud to say that I have developed sevaral ways (for me, or who knows you can also use it) for me to resist this kind of negative emotion. I am not trying to be expert on this subject but trust me, I have been in this roller coaster for so many times and I overcame it with great pride. 1. Stay positive. I am a very positive person and always look things on the brighter side. I don't care how others think of me, what's important is that I know myself and I don't have to please anyone. Just put into your mind that everything will come in a perfect time. The bad effects will leave us soon and the happy moments will return. Think of the positive outcome and result of what you are having now, loneliness will not bring you to higher joy and it will not even add additional hours into your life. Face the world with optimistic mind and never turn your face into ugly aspects of life. Prayers are also helpful in these times of being alone, literally, physically and emotionally. 2. Get busy. For the last few weeks, to ease the pain of loneliness, I always ensure to hit the gym to release the stress and keep myself busy. The positive result is quite impressive, I can see and feel that I am losing weight. If we are busy, we will forget about being alone and for myself, it gave me benefits. I became healthier and the sad moments were minimized. Also, you can try to get out of your comfort zone, try new other things that you don't normally do. Like for me, I am not a big fan of window shopping but since I am living right next to a huge mall, I have all the time to see those material things but be ensure that you don't bring your credit card or a lot of cash so that there will be no expenses involve. Cleaning your room will also help you or rather redecorating your crib will create an atmosphere of excitement haha. 3. Read and surf. There are lots of interesting books coming out lately and you can make a plan of reading an entire book for a week or even just for days. Reading will bring you anywhere in the part of the world and the imagination will also be enriched. Another thing you can do is surf the internet, facebook, twitter, foursquare, tumbler or any social networking site that will give you a feeling of "connection" to other people by means of internet. Chat with your family, call them free using Skype or you can even have a webcam session for the entire family. The modern technology actually made the world a smaller place. Loneliness is just a state of mind that won't bring any positive outcome. Maybe it's enough to feel it for hours or just a day but make sure that it will not lead to depression as that is a different stage and subject. We all feel loneliness but what's important thing is to know that we are humans and everyone of us have the same fate, we have the right to feel things, to be sad from time to time. But what matters most is how we overcome it, how we became victory from it and how we claim the triump behind those times. 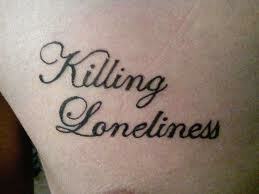 I am sure there are other ways on killing the loneliness. There are several ways, discover it and time flies so fast that one day you will realize that those times were just a waste of what could be wonderful memories.